Presently the Manufacturers in order to gain more profit higher than that of their expectations are mainly focusing on the evolving markets to launch their new devices. Thus because of this reason business are searching for the developing markets rather than that of the developed. The majority of the people approximately 84% are using the Android-based devices because of its affordability, user-friendly & usability interface. Hence in order to enhance the digitization & online transaction people are now making the strategy to develop the Android Apps & deploy it in the Market. It is necessary to consider the Android App Development strategy for the developing Markets. Hence following is the discussion about the same. The basic strategy is to identify your target Audience. Once you are done with it just list out the features that are to be included in your application. The success of your app is completely depended on the satisfaction of the User. Hence be sure that Users are downloading, installing & using your app. In order to develop the seamless app, your app needs to develop the proven strategy. 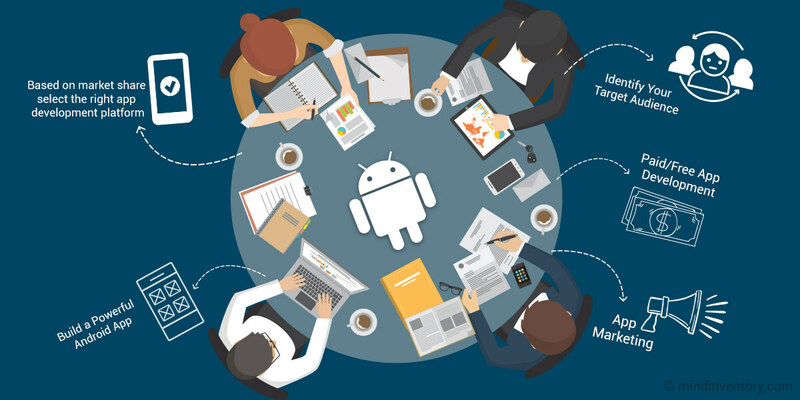 To develop an Android App strategically a complete process requires the influential leadership. As compare to that of the iOS, there are many users on the Android. So this platform is considered to stand out in the market segment. Also recently the Google announced the Android preview of O. Hence Android developers have the great opportunity to establish the app with the new rich features. An essential need is to develop the free Android App or paid one. If you’re going for free Android App lock some attractive features so that users can get engaged in this way. You can enhance the visibility of your android app on the play store with perfect marketing and optimization activities. Remember, you have to rank your app on the top list of the Google play Store in order to enhance traffic on your app. Create qualitative research to recognize the reasons that lead maximum downloads. It becomes important to develop brand awareness of your app using eye-catching graphics, icons, features, videos, descriptive screenshots and much more. In order to grow the ad conversion rates and organic growth, localization of the app becomes an important marketing feature to make mobile apps successful. Using the influential strategy for Android apps development for developing markets assists your android app development company to enhance chances to develop a successful and customer-centric android app.